I can't wait to see what the tv ratings were today. Woods' first PGA Tour win in five years delivers the biggest overnight numbers on record for the Tour Championship. Tiger Woods earned his first PGA Tour win since 2013 on Sunday, and a lot of people watched it happen. Overnight ratings for the Tour Championship's final round on NBC are more than double what they were in 2017, and set several records for the tournament. Woods shot a 1-over-par 71 in the last round, which was good enough to maintain his lead after three rounds and to win his first tournament since August 2013. NBC's coverage of the tournament's final round (1:30-6:15 p.m. ET) earned a 4.4 household rating in overnight metered markets, more than double the previous year's rating and the best overnight mark for the Tour Championship on record (which goes back to 2000). From 3-6:15 p.m., it averaged a 5.2, making it the highest-rated telecast in the history of the FedEx Cup Playoffs (dating to 2007), which close the PGA season. "Tiger Woods' win at the Tour Championship was an unforgettable event in golf," said Mike McCarley, president, golf at NBC Sports Group. "The massive gallery following Tiger up the 18th fairway was matched by record viewership across NBC Sports platforms." Excluding the four major tournaments, Sunday's broadcast was also the highest-rated single telecast of any PGA Tour event in 2018. I had to chuckle at the narrative on TV... "The greatest sports comeback ever?" "Nobody in the world thought he would ever see Tiger win another tournament ever?" Tiger Woods wins his first Major since the 2008 U.S. Open. 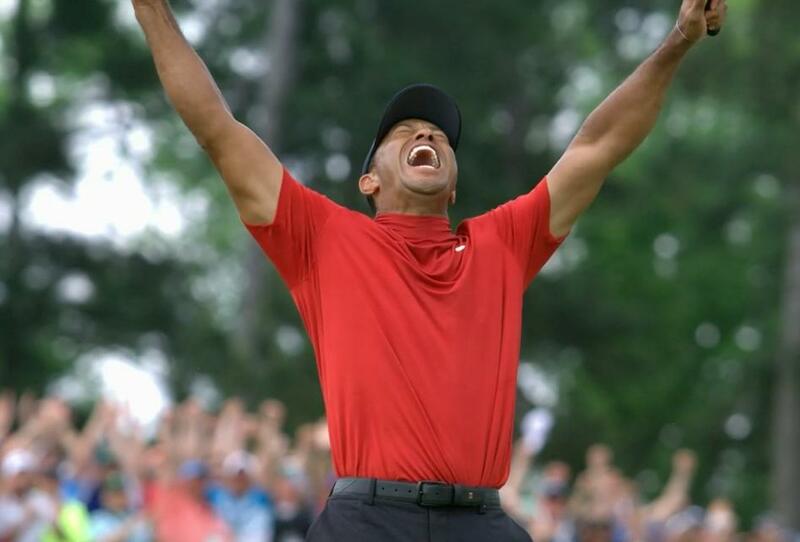 Tiger Woods wins the Masters for the 5th time. I had made plans with the family today for the lunch hours, so I could be home in time to watch final round (and Long Beach Grand Prix, but that's another story). Even said I wouldn't go to cardio tennis because I would be "unavailable " for so long today. Then tee times get moved up. The Mrs. allowed for a change, and went on her own, with dinner plans changing. It was so worth it to watch the round in its entirety. Truly amazing drama. Always is at the Masters but another level when Tiger is prowling (and winning his 1st major when not leading going into the final round). Sidebar - Michael Phelps was there, Serena tweeted, and so did Tom Brady. Lots of goats! The scene where he was walking up to the final hole and the entire gallery was cheering him like crazy gave me chills. Then I saw his mother and I dunno, something got in my eye. Must've been allergies. The tweets from Brady, Serena and Phelps being there were great. All three of them have had to face adversity and negativity. Since the apotheosis of Tiger Woods is well underway, I would like to note that the turnaround he appears to have made in his personal life is far more significant than his remarkable, near unbelievable comeback as a golfer. So very much deserved. 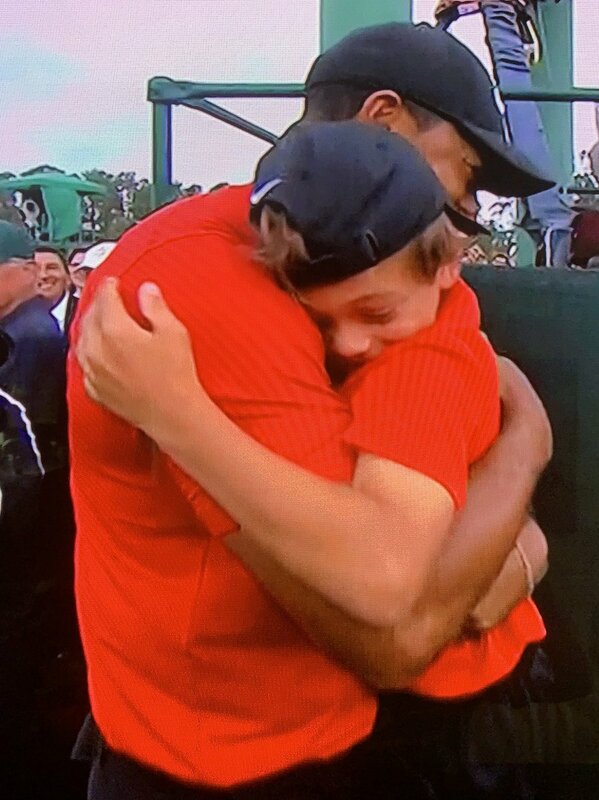 Well done Tiger! Have the numbers for Masters been posted? 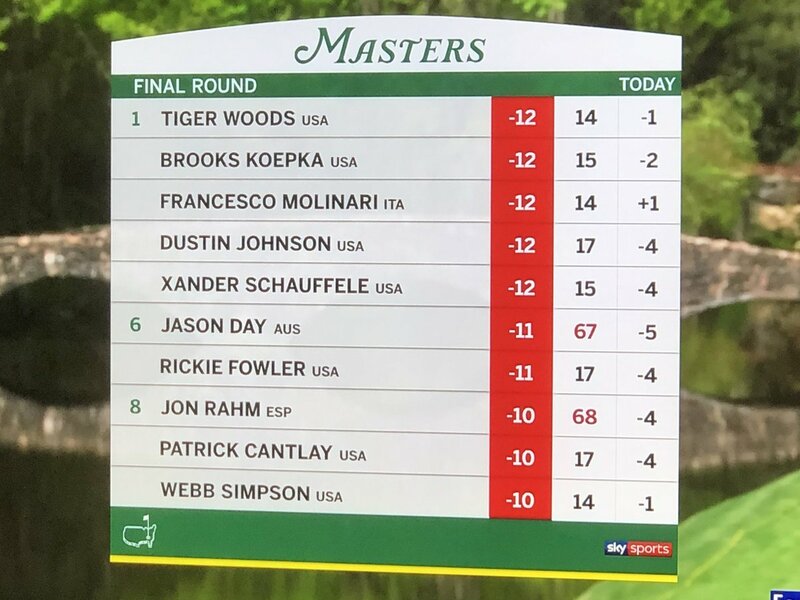 TV ratings for Sunday’s final round of the 2019 Masters Tournament at Augusta National Golf Club came in strong after Tiger Woods’ victory. Live coverage of Sunday’s final round on CBS earned the highest overnight rating for a morning golf broadcast in 34 years, according to CBS Sports. It delivered a 7.7 rating on Sunday morning, as the final round tee times and groupings were moved up to avoid inclement weather on Sunday afternoon. However, due to the early start time, the 7.7 rating is the second-lowest for a Masters final round since 2004. 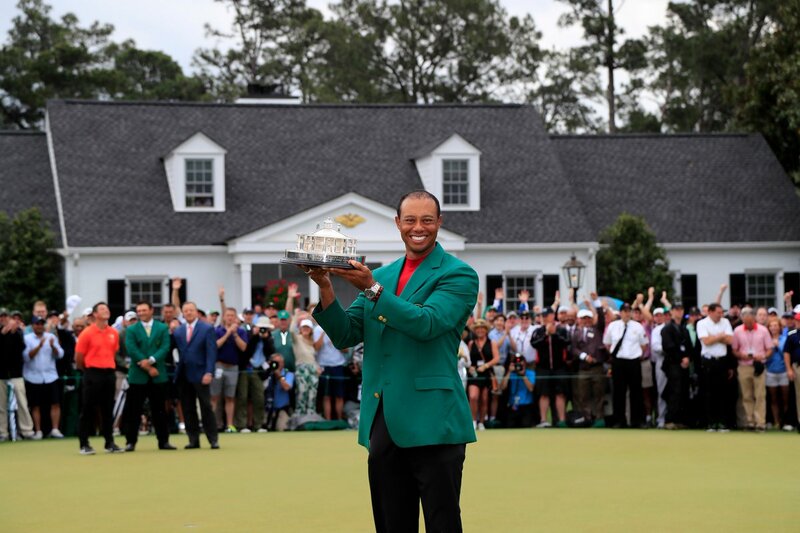 It also resulted in the highest-rated golf broadcast on any network since the final round of the 2018 Masters. Last year’s final round, which aired in its usual Sunday afternoon time frame, had an 11 percent higher viewership than this year’s, according to Sports Media Watch. The final round peaked in the 2:15-2:30 p.m. 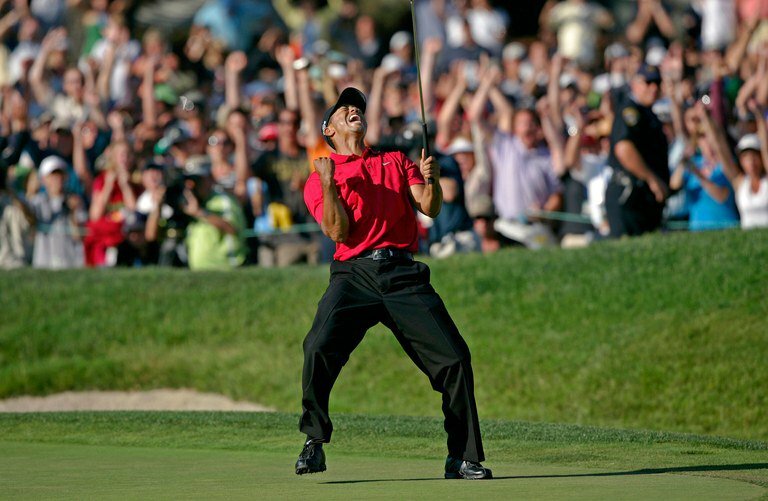 ET time range, as viewership spiked to a 12.1 as Tiger earned his fifth green jacket and 15th major title. It’s the highest peak rating for the Masters since 2013. Sunday’s live final round coverage and encore presentation on Sunday afternoon earned a combined gross household 11.1 rating in metered markets. Sunday’s final round also tied the highest share of TVs in use for any Masters telecast since 2011. The broadcast had a 21 share, which is a 17 percent increase from last year’s final round. It’s safe to say that Tiger Mania is real. I'm disappointed I missed most of it - I kept checking the scoreboard and wondering why the TV coverage didn't start till 2pm - somehow missed that the start times had been moved up.